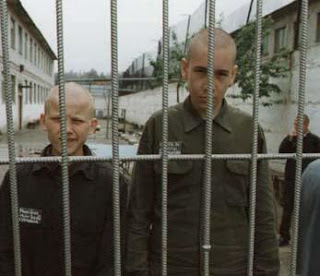 No "Zeks" please -- we're Americans: Inmates of Soviet Russia's gulag. Seeking to catechize the public regarding the all-encompassing threat of terrorism, the State of Alabama's Homeland Security Department created a “Terrorism Awareness and Prevention” curriculum. Let's make this clear: It isn't state terrorism to immolate scores of innocent people, as happened at Waco, or for federal assassins to gun down a fleeing teenager and a nursing mother, as they did at Ruby Ridge. Describing those atrocities as I just did, however, is sufficient to distinguish one's self as a potential terrorist – particularly if one draws the sensible, nay irresistible lesson from such episodes that only a suicidal fool would permit the Regime to disarm him. Only an insensate clod – someone as dim as Mr. Dull Normal, the current occupant of the Oval Office – could miss the fact that the Regime systematically violates the “principles laid out by the U.S. Constitution. And only a hypocrite or a State-employed sociopath could believe that the Regime is not transgressing God's law. And only a totalitarian government would require that its subjects believe in the Regime's inexhaustible righteousness. Remember, this official taxonomy describes those holding anti-government beliefs as terrorists – the domestic face of an enemy we are told must be summarily exterminated, or at least imprisoned in perpetuity without legal recourse. Single-issue activists – such as pro-life protesters – also find themselves on the list because ... well, because the people who wrote that list don't care for their politics, I suppose, and what good is it to be a taxpayer-fed drone if you don't get to anathematize your critics? After the Alabama TAP curriculum received a great deal of publicity in the Blogosphere, the people who created it reacted in predictable fashion: They removed it from the website. Fortunately, it is still accessible through the WayBackMachine – a veritable Atavachron for Web researchers. A few years ago, somebody leaked a copy of the equivalent document produced by the State of Virginia, a short manual entitled “Terrorism & Security Awareness Orientation for State Employees" (.pdf). So those who believe in the sanctity of private property, and insistently publicize their belief, are to be scrutinized as latent terrorists. It's important to recognize that terrorist taxonomies of this sort did not spring up after 9-11; many states were working off the same template long before the Towers fell. 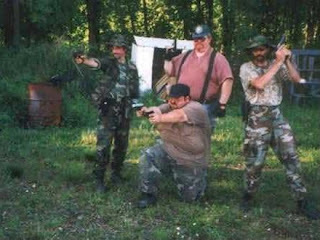 The "Redneck Militia" -- Embodiment of the supposed threat that haunts the sleep of Morris Dees and his ilk. In 1999, as I have noted elsewhere, the Phoenix office of the FBI distributed a counter-terrorism pamphlet that advised readers: "If you encounter any of the following, call the Joint Terrorism Task Force." Several categories of potential terrorists were listed, including "Hate Groups" such as Nazis, Black Separatists, Klansmen, and the like; "Single Issue Terrorists," such as animal rights radicals, eco-terrorists, and "insurgents"; and "Left-Wing Terrorists" motivated by "Marxist/Leninist philosophy." The very first category listed in the document -- and, one assumes, the single greatest danger -- was "Right Wing Extremists," specifically "'defenders' of US Constitution against federal government and the UN (Super Patriots)." Police were also warned about "Common Law Movement Proponents," who run the gamut from eccentrics who refuse to obtain drivers' licenses and license plates to people who simply "make numerous references to [the] US Constitution." Ah, but the real danger is that represented by people who invoke the Constitution, rather than the particularly sanguinary passages of the Koran. The document he referred to was Project Megiddo, a work of indifferent scholarship and untutored alarmism disseminated by the FBI to law enforcement agencies nation-wide in November 1999. 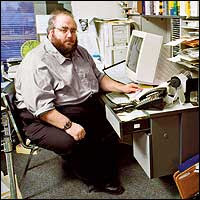 Purporting to be a "strategic assessment" of domestic terrorist threats associated with the Y2K observance, Megiddo was inspired by – nay, most likely ghost-written by – left-wing “watchdog” organizations like the dishonestly named Anti-Defamation League (ADL) and the Southern Poverty Law Center (SPLC), the racial ambulance-chasing racket founded and operated by self-promoting pervert Morris Dees. The ADL's Mark Pitcavage: Self-appointed "expert" on the "radical right," full-time gravity well. "Religious motivation and the N.W.O. [New World Order] conspiracy theory are the two driving forces behind the potential for millennial violence," according to Megiddo. "The volatile mix of apocalyptic religions and N.W.O. conspiracy theories may produce violent acts aimed at precipitating the end of the world as prophesied in the Bible.... Religiously based domestic terrorists use the New Testament’s Book of Revelation — the prophecy of the endtime — for the foundation of their belief in the Apocalypse. Religious extremists interpret the symbolism portrayed in the Book of Revelation and mold it to predict that the endtime is now and that the Apocalypse is near." Reading those words now, I'm struck by the fact that they seem to describe George W. Bush's core constituency, who consistently support aggressive war and unalloyed domestic tyranny to combat the Mohammedan menace. We should expect them to become born-again believers in the virtue of constitutional restraints on power should Madame Hillary become our next elected dictator. “1) private property rights and private gun ownership will be abolished; 2) all national, state and local elections will become meaningless, since they will be controlled by the UN; 3) the U.S. Constitution will be supplanted by the UN charter; 4) only approved churches and other places of worship will be permitted to operate and will become appendages of the One World Religion, which will be the only legitimate doctrine of religious beliefs and ethical values; 5) home schooling will be outlawed and all school curriculum will need to be approved by the United Nations Educational, Scientific and Cultural Organization (UNESCO); and 6) American military bases and other federal facilities will be used as concentration camps by the UN to confine those patriots, including the militias, who defy the N.W.O. Other groups besides the UN that are often mentioned as being part of the N.W.O. conspiracy theory are Jews, Communists, the Council on Foreign Relations, the Bilderbergers and the Trilateral Commission. Law enforcement officials will probably notice different versions of this theory, depending upon the source." Where, oh where, did the FBI's diligent, intrepid investigators uncover this shocking intelligence? Did they infiltrate a terrorist cell at great risk to life, limb, and virtue? Did they deploy some Samurai-caliber undercover asset who snatched the key of knowledge from the hidden lair of our terrorist enemies, armed only with only his sinewy limbs and MacGyver-quality wits? Megiddo also diagnosed concerns about civilian disarmament as a symptom of terrorist tendencies: "The passage of the Brady Bill and assault weapons ban in 1994 were interpreted by those in the militia movement and among the right-wing as the first steps towards disarming citizens in preparation for the UN-led N.W.O. Takeover. Some are convinced that the registration of gun owners is in preparation for a confiscation of firearms and eventually the arrest of the gun owners themselves.... Speculation like this only serves to fuel the already existing paranoia of militia and patriot groups." 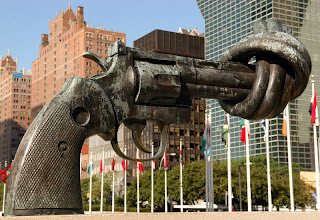 This sculpture, entitled "Disarmament," is the first thing visitors see when they enter the UN Headquarters compound in New York City. The gun depicted here is a civilian firearm. Some of us regard this to be a clue regarding the intentions of the people running the UN. That makes us "terrorists," of course. The whole point of Megiddo and the equivalent documents produced at the state level is to designate critics of the government as “socially dangerous persons.” That phrase is taken from the Soviet Union's Fundamental Principles of Penal Legislation, adopted by that regime on October 31, 1924. It was enshrined in Soviet law as Article 58 of the penal code – the legal foundation of the gulag. The Black Book of Communism — an authoritative study of the crimes committed by the Soviet Union and its descendants – Article 58 "codified the notion of a ‘socially dangerous person.’ Among counterrevolutionary crimes, the law included any activity that, without directly aiming to overthrow or weaken the Soviet regime, was in itself ‘an attack on the political or economic achievements of the revolutionary proletariat.’ The law thus not only punished intentional transgressions but also proscribed possible or unintentional acts." The category of "socially dangerous persons" was based on "extremely elastic categories" that permitted individuals to be sentenced to the gulag "even in a case of total absence of guilt,” continues the account in the Black Book. Of course, the same is true now of those consigned to Gitmo: Mere exoneration doesn't mean that a detainee is free to go. Under Soviet “law,” continued the compilers of the Black Book, the state was permitted to “use these measures of social protection to deal with anyone classified as a danger to society, either for a specific crime that has been committed or when, even if exonerated of a particular crime, the person is still reckoned to pose a threat to society." Megiddo and its offspring are designed to create the largest possible pool of potential terrorists, and provide the “legal” justification for their detention (or, quite possibly, their liquidation). This program began long before 9-11; it won't end when George W. Bush vacates the White House, assuming that he ever does. I was interviewed this morning by the incomparable Scott Horton for AntiWar Radio; keep checking here to find out when the program will be broadcast. Those not intimidated by the prospect of being tagged as a terrorist are invited to visit The Right Source -- your on-line home for unreconstructed anti-government news and commentary. "You Can't Pray A Lie"